You may suspect that chronic inflammation symptoms caused by food is behind your aches, pains, allergies, fatigue and other discomforts you are experiencing, but how do you know for sure? 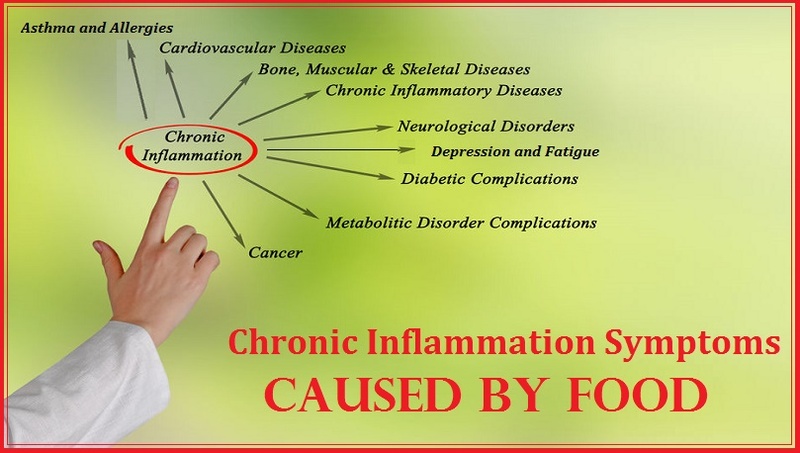 Many people don’t make the connection between symptoms they experience everyday and inflammation until they are diagnosed with an autoimmune disease or another health condition that involves inflammation. Whether you have been diagnosed at this point or not, it is time to check your body for common inflammation symptoms that can be caused by the food we eat. You may notice some of these symptoms after you eat specific types of food, or they may strike at seemingly random times. You may suffer them so often that you don’t think much about them, but your body is trying to tell you something. It’s time to listen. How much time do you spend sitting on the couch watching your children play rather than playing with them? Do you frequently say no to social engagements that you would actually love to attend because you simply don’t have the energy to make it through? If you experience fatigue that is unexplained by known medical conditions, it is possibly a symptom of inflammation causing chaos inside your body. Do you have days where you simply don’t feel good? Are you always joking that you are getting old because your joints hurt or you have aches in specific body parts for no apparent reason? It’s true that getting older will cause changes in how you feel, but consistent, unexplained aches and pains are likely symptoms of inflammation or other problems occurring inside your body. For example, if you experience pain or achiness in your hands, you may face a diagnosis of arthritis in the future. Some people suffer asthma their entire lives and it doesn’t have anything to do with inflammation or the development of autoimmune disorders. You may also experience allergic reactions to certain foods or medications without it indicating that you will one day suffer an autoimmune disease. Yet, asthma and allergies are symptoms that your body is reacting negatively to internal conditions. You may need to eliminate certain foods to stop allergic reactions, and asthma may seem to come out of nowhere as a result of increased inflammation inside your body. When you breathe in a toxic substance, you can instantly feel the effects. Your eyes may water or turn red, you may start to cough or you may feel your nose burn. These are allergic symptoms triggered by your immune system to fight off the sudden onslaught of toxins. The same can happen if you are exposed to a toxin in your everyday environment on a routine basis. That toxin can even be a food that you enjoy eating. Are you laughing so hard you cry one moment and crying so hard you may never laugh again the next? Unexplained changes in mood or over-the-top emotional reactions that are beyond your control may signify disharmony in your hormone balance, and that is sometimes a symptom of inflammation. This is particularly true if you are a woman of the proper age for the onset of menopause. Many women experience increased inflammation as they go through this period of life change, but don’t rule it out if you are too young or have already gone through menopause. Inflammation can cause fluctuations and changes in hormone levels, so pay attention if your moods try to tell you something. Notice the variety of inflammation symptoms listed here. Is it any secret why autoimmune disorders and inflammation are sometimes difficult to diagnose correctly? The symptoms are so varied and most can easily point the finger at other medical conditions.